If you love Mountain Biking then you have to visit in Les Gets and Morzine to experience some of the best Bike Parks in Europe! With 90km of marked mountain bike routes and dedicated lifts for mountain bikers, Les Gets is a truly biking friendly resort. The stunning scenery just adds to the fantastic experience of mountain biking in the Alps. 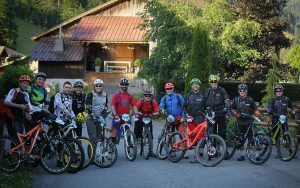 For the expert & pro level riders there are challenging downhill biking routes and a fantastic bike park to push the most skilled Freeride biker. Fabien Barel (two times mountain bike World Champion including here in Les Gets in 2004) was one of the technical adviser for the Les Gets Bike Park – there’s an awesome selection of jumps, walls, tabletops and gaps to challenge even the most fearless of Freerider! Les Gets is perfectly designed as a mountain bike resort. With the bike park plus 13 downhill trails to suit every rider – a week just isn’t long enough…. there is also a specially designed Freeride trail, 6 cross country trails, a jump park, a mini jump park, a North Shore zone, a 4 cross track, a dedicated coaching track, a pump track and a kids zone. Cross country is extremely well catered for with six routes available to suit different skill and fitness levels. Cross country is a fantastic way to improve your fitness and enjoy the mountain scenery from your bike, but if you pick an advanced route beware taking your eyes off the track for too long! For families & children there are stunning cross country and downhill routes to try out mountain biking and enjoy the beautiful mountains on slightly less extreme routes! With clearly marked and graded routes biking can be enjoyed by all the family without fear of stumbling across the downhill extreme riders (or their jumps) by mistake. Children may also like to have a go at their own mini jump park and North Shore area. There is a small North Shore area right in the village where children can get a feel for riding along the wooden obstacles. They are small, low to the ground and perfect for a first go – whatever your age! Whichever category you fit into – mountain biking in the beautiful Alpine resort of Les Gets will be an experience you will want to repeat every summer.